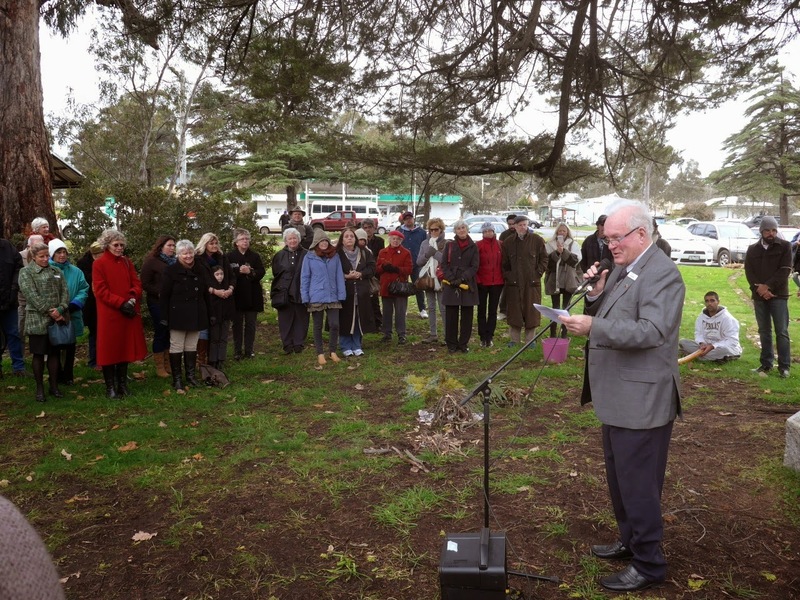 On July 10, during NAIDOC week, around fifty people braved the cold to attend a ceremony to rename a stretch of the old Calder Highway between Elphinstone and Harcourt. The new name is Harmony Way, after a respected Aboriginal figure of the late 19th Century. Henry ‘Harmony’ Nelson was one of the ‘apical’ elders of the Dja Dja Wurrung clan. The Dja Dja Wurrung are recognised traditional owners of the area. Henry is one of eighteen individuals whose descendants can be regarded as members of the clan. He was born around 1855. He spent much of his youth in the Mount Alexander region, as well as travelling between major centres of traditional activity throughout his long life. Despite being removed under duress to Cummeragunja and Framlingham, he and his descendants maintained a connection to the area. These days, several generations of Nelsons reside here. The decision to rename the Old Calder Highway was made by the Mount Alexander Shire Council in 2012. The renaming process included community consultation. Representations were made to Council and VicRoads by several local people, as well as the Nelsons and the Dja Dja Wurrung. Appropriately, the renaming ceremony was held beside the scar tree in Stanley Park. New signage was unveiled, explaining the name and Henry’s association with the region. Mayor Michael Redden outlined the lengthy process of deciding on a name, then guiding it through State Government and VicRoads channels. He spoke of the significance that the new name has to both indigenous and non-indigenous Shire residents, as well as visitors. “This significant honour provides lasting recognition of Henry Harmony Nelson, a prominent figure in the history of the Dja Dja Wurrung people,” said Mayor Redden. Uncle Rick Nelson, himself an elder of the local Jaara Jaara people and a direct descendant of Henry, agreed the decision had meant a lot to the Nelson family, the Jaara Jaara and all the Dja Dja Wurrung.